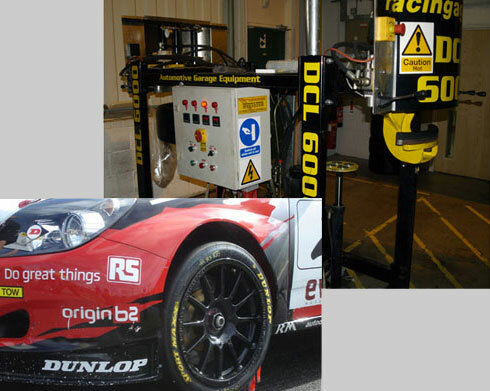 RacingAGE A Division Of Automotive Garage Equipment Ltd.
For many years now Automotive Garage Equipment have been involved at the forefront of Motorsport. We have supplied all of the wheel balancers used in Formula 1, tyre equipment for world and national touring car championships, equipment for Le Mans, LMS, Superbike, A1GP, Rally and we are often at the track working at events national and international. Our expertise in tyre equipment for motorsport is second to none, this expertise has been drawn on by many of the worlds leading tyre company's racing divisions for us to supply, design and modify equipment to suit this area of tyre equipment and the unique challenges that the motorsport environment brings. Customers of ours include Dunlop Motorport, Bridgestone Motorsport, Avon Motorsport, Yokohama, Michelin, Pirelli Motorsport, Mercedes F1, Mclaren F1, Pro Drive...................The List goes on! As our ever growing involvement in motorsport proves, we are always at the forefront in tyre technology. Racingage where once again working alongside Dunlop Motorsport at the Dubai 24hr 2014 race. Here is a short timelapse film we made to show what goes into setting up what is most probably the busiest tyre fitting service in the world! Racingage where once again avoiding the cold of the UK winter by working non stop in the middle eastern heat at the annual Dubai 24hr race. 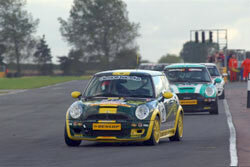 The world famous Silverstone track was again host to the Britcar 2011 race. RacingAGE where there alongside Dunlop Motorsport. 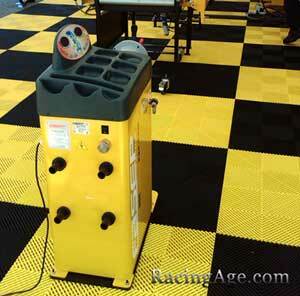 RacingAGE's successful tyre decal machine has been in action, this time in the south of France with Yokohama. RacingAGE already provide all of the fitting equipment for Yokohama's world touring car fitting service and we where delighted when they asked to see our mobile decal machine in action. They in turn where delighted with the results. RacingAGE.com are adding Fasep to their already impressive portfolio of suppliers. After an impressive test on the British Touring Car event Dunlop decided to change their wheel balancers to the Fasep B221. With its compact size, Haweka locknut, automatic wheel data entry and speedy spin cycle RacingAGE.com felt there was no other machine for the job and were delighted that Dunlop agreed. The Fasep B221 was also chosen by Dunlop Motorsport for a complete new tyre service, again supplied by RacingAGE.com for the Seat Cupra cup in France. Automotive Garage Equipment were called upon by Dunlop Motorsport, suppliers of the tyre's for BMW M3, to design and install a brand new tyre line for the American Le Man's Series. Once again Yokohama have chosen equipment supplied by Automotive Garage Equipment for the World Touring Car Championship. Yokohama have just taken delivery of two new modified Giuliano RacingAGE S222 tyre changers following 3 years of trouble free hard work from their previous S222 machines also supplied by Automotive Garage Equipment. In a testament to the build quality of the Giuliano tyre machines the whole of the WTCC field relies upon the subtly modified 'entry' level tilt back RacingAGE S222 tyre changer's to fit their tyre's!. The machines fit hundreds of tyre's week in week out all over the world in ever changing weather conditions. Yokohama already use Ahcon inflators and Focus wheel balancers, all supplied and serviced by Automotive Garage Equipment. The RacingAGE Giuliano S222 has been popular in motorsport for several years now due to its rugged construction, speed and compact design. Pushing tyre equipment and people to the limit is 24hr motorsport racing. This year we were at both Le Mans and Britcar. They also join in assisting with tyre engineering and on the tyre line fitting and balancing the thousands of tyre's that and event like this gets through in a weekend. 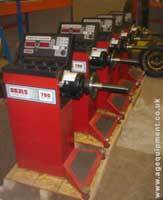 Automotive Garage Equipment are proud to supply all of the wheel balancers for Formula 1. Since Bridgestone Motorsport entered the F1 arena they relied upon Automotive Garage Equipment to supply modified Coats wheel balancers, this year was no exception with the requirement of more new machines. To date we have supplied around 40 Coats 700s to Bridgestone Motorsport. 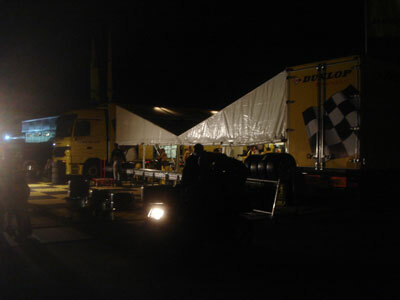 Once again we have been working alongside Dunlop Motorsport on the British Touring Car Championship. 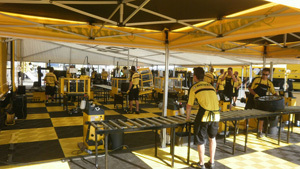 The Dunlop BTCC/Great and British tyre service. 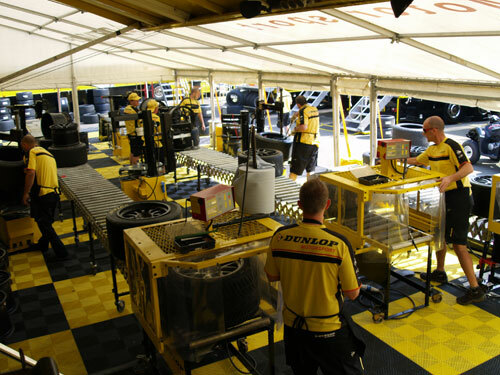 All of the equipment used on the Dunlop BTCC/Great and British tyre service is supplied, modified and serviced by RacingAGE. All of the equipment is supplied, modified and serviced by RacingAGE A division of Automotive Garage Equipment Ltd.
As Well as supplying all of the fitting, balancing, inflation, and tyre printing equipment we are on hand at every meeting helping out with tyre engineering, tyre fitting and wheel balancing. 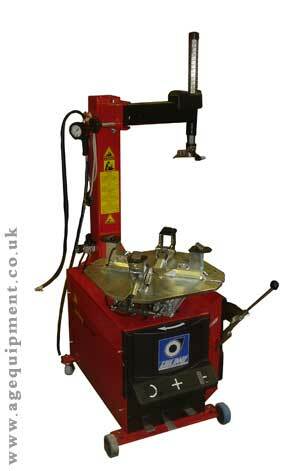 We have also recently designed and manufactured an all new bead breaker. The machine has proved so popular that a further 3 machines have been ordered by Dunlop for other events. 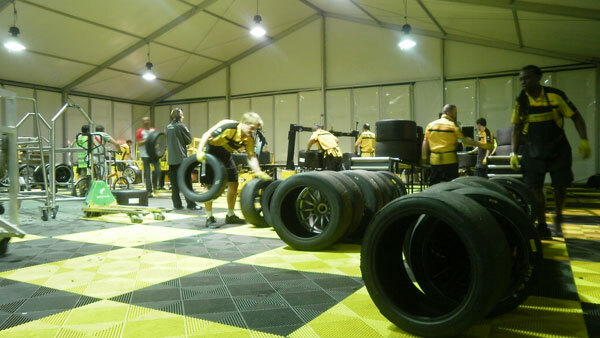 The Dunlop Le Man/LMS tyre service. A division of Automotive Garage Equipment Ltd.
As well as being at every BTCC, G+B and Le Mans we are also at every LMS event alongside Dunlop Motorsport. Team spirit together with long distance performance, as embodied by the "Le Mans 24 Hours" is the credo of the "Le Mans Series". As a most legendary race, the French event's duty is to offer its competitors a full season to race their cars and contain the costs. Furthermore, offering a direct selection for the "24 Hours of Le Mans" to the two winners of each category is definitely a bonus for the series. The original brand new machines were completely stripped down to the last nut and bolt, the cabinet was then cut, modified, strengthened an re assembled. The modified cabinet is the shot blasted and re powder coated in Dunlop Motorsport colour's. The machine is then carefully re assembled including any other modifications that were required. Some machines had the Bead breaker completely removed, whilst some still have the bead breaker fitted. The machine can now cope with the wider wheels that are used on Le Mans Sports cars, and the operator can fit them at a more ergonomic height. 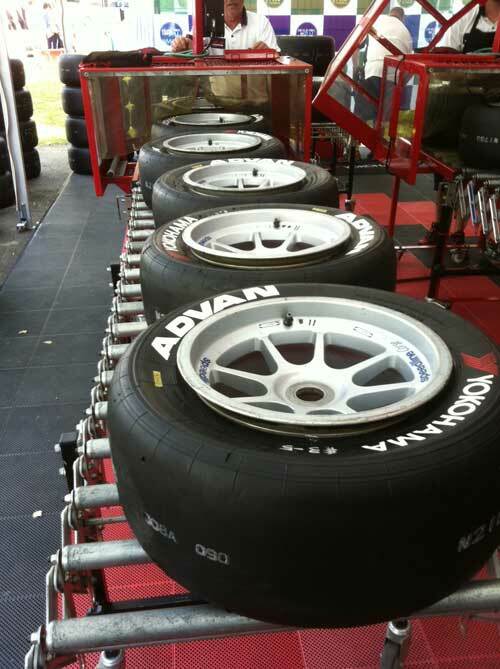 We were delighted to supply all of the tyre equipment for the Spanish Touring Car Championship. As soon as the equipment was ready one of our engineers was flown out to ensure the machines all worked correctly and to train the spanish staff on usage. Yokohama have chosen Automotive Garage Equipment to supply all of the tyre equipment for this prestigious series. We supply modified tyre changers to Pirelli for the World Superbike series. Pictured to the left is one of the modified Giuliano S112F tyre changers currently in use on World Super Bikes By Pirelli Competition. For more information on the S112f click [HERE]. Following on from our successful previous decal machines we were asked to design and manufacture a new machine by Dunlop Motorsport. So came the DCL 6000, this machine is a double headed machine so it can print 2 tyre simultaneously. such as Le Mans. British touring Cars and DTM amongst others. supplied the equipment for the recent DTM test session at Brands Hatch..
We were also present to help fit the tyre's and to ensure the smooth running of our tyre equipment. We are delighted that Cooper Avon tyre's have chosen Automotive Garage Equipment to supply the tyre service equipment for this prestigious race series. With a long history with Cooper Avon tyre's supplying equipment for a number of race events such as A1GP, we are delighted this partnership has continued in to a new and exciting phase in motorsport. We will soon have pictures of the UK GT series, and of the equipment we have supplied. 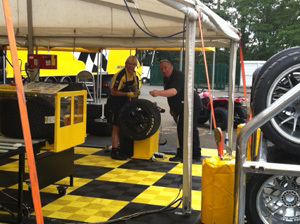 Dunlop Motorsport British Super Bike Tyre service. 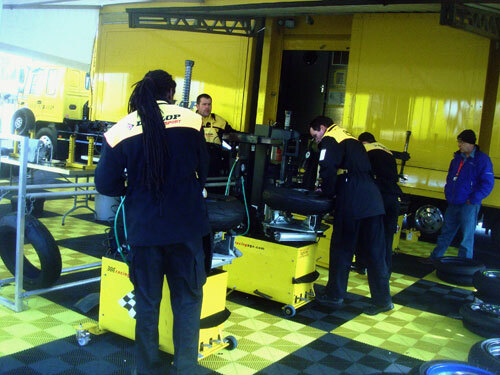 We were on hand for the first race of the 2006 season to help with the fitting and ensure the smooth running of the service. A few of the pieces of equipment that we have either modified or manufactured over the years for specialist requirements are detailed below. Please click on the thumbnail images for a larger image and information on each project. If you have a project that you would like our advice on please do not hesitate to contact us. Throughout the winter we have been heavily involved the colour scheme change for Dunlop Motorsport. 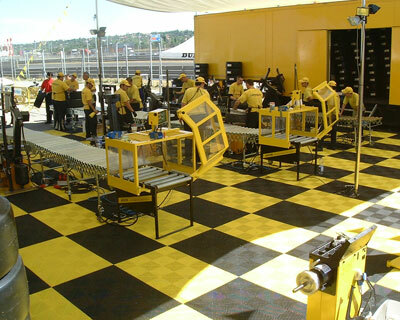 They decided to change from the red and black machines they had to black and yellow to fit in with their corporate image. We were involved from the planning stage by creating digital mock up images of machines with different combinations of black and yellow. Once a scheme was decided we then had to recondition a number of machines, this involved completely stripping, re powder coating and re assembling the machines. 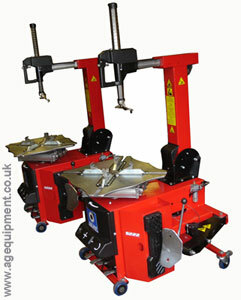 We also supplied a number of new machines in the new colour scheme. Automotive Garage Equipment have supplied Triumph Motorcycles with a wide range of equipment at their new production facility's. Automotive Garage Equipment have just kitted out the Jaguar Cars facility at MIRA. No pictures allowed. Dunlop Tyre's are now fitted to the lister Storm. Click [HERE] for our exclusive pictures. We are currently advising the Forensic labs in London on the best equipment that suits their unique requirements. They regularly have to deal with wheels that have been severely damaged in accidents. We supplied them with a [Giuliano S225] as this machine met their criteria for a reasonably priced, strong machine that can be fitted with accessories that will assist them with the removal of low profile tyre's from damaged alloy wheels. This had to be done without causing additional damage to the wheel. This was achieved by the fitting of nylon jaw covers and the patented Giuliano interchangeable mounting head system. We were to be seen at Rockingham with specialist equipment for the NASCAR series return to the UK. 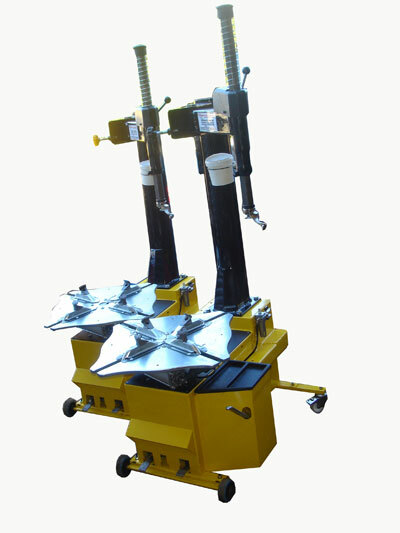 We have supplied Kumho Motorsport with bead breaking equipment, inflation system and conveyor system. 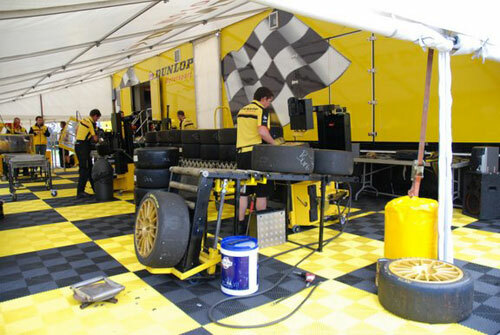 We are proud to have supplied all of the wheel balancers, tyre changers, inflation systems and tyre marking equipment for Dunlop Motorsport for Le Mans 2002. Dunlop was of course the chosen tyre brand fitted to the Bentley EXP Speed 8 for their return to Le Mans. Click [HERE] for our behind the scenes pictures of Le Mans 2002. 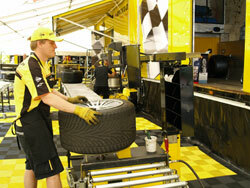 We have recently supplied Minardi with tyre fitting and wheel balancing equipment. We have recently supplied a wide range of equipment to Toyota cars for their test facilities at MIRA.